Throughout National Poetry Month this April, OUT will be spotlighting our favorite OUTspoken queer poets and premiering exclusive new works. 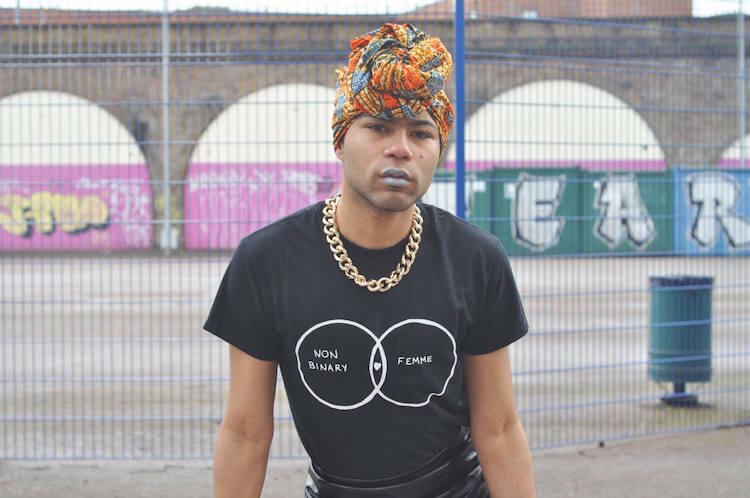 Travis Alabanza is a London-based trans femme performance artist and writer. Their work fuses live performance with a combination of poetry, sounds, projections and theatrics to create confrontational art centered on their experience of surviving as a black, trans individual. In celebration of National Poetry Month this April, OUT premieres today Alabanza’s original poem "The Sea," along with a brief discussion on survival and why trans femme writers of color are the future. OUT: What is your main focus when writing poetry? Travis Alabanza: It changes all the time, but primarily, I'm always writing [and] creating from a place of healing. I've tried to venture other intentions, like to educate [or] stem action, but I think the type of artist I am leads me always back to healing. I write to survive, to process, to put to bed things, to wake things back up. Why is it important for queer poets to be heard? Writing is already super queer, right? I think the way poetry slips out of tongues and into ears already feels like a queer'd way of transporting knowledge. So it is only right for us queer folk to lead it. I think queer poets need to be heard because queer people need to be heard. We have things we need to say, and poetry is dominated by cis, straight, white men, but queer narrative can help change that scene, invite new voices and create a more interesting dialogue. What do you think is the future of queer poetry? Queer black and brown poets, trans femme poets, gender non-conforming poets. Sometimes I stand by the edge of where the ocean meets the beach, and look out into the sea, so I can see something that does not have an end. and I want to say: it is more like, what I wish it could feel like? I wish it could feel like this moment. Like it does not have a beginning or an end. That you cannot see where it starts or stops. That it just continues to exist, or not exist. That it is a vast space of nothingness in one wave, and holds so much in the next. That it is like the moment where the sea feels endless. Sometimes I stand by the edge of where the ocean meets the beach, and look out into the sea, so I can feel like something that does not have an end. Cis people ask me what my gender feels like and that never allows me to say what my gender really is. My gender feels like something stopped halfway through. A badly formatted tape to CD conversion, missing full potential. The second character on a video game, without levels , no up or down. A body of water, potential to do so much, yet eventually bottled. Sometimes I stand by the edge of where the ocean meets the beach, and look out into the sea, that looks out over my gender, that pours over my body, and makes me feel like nothing.